Nov 15, 2017 Posted by AAfterwit on Nov 15, 2017 | Comments Off on How Trump Hates Blacks. The narrative is that President Donald Trump hates blacks or any other ethnic group that is not white. And because that narrative is thrust in the face of everyone almost on a daily basis by so called social justice warriors, ANTTFA, leftists, progressives and Democrats (which may be repeating ourselves,) it must be true, right? Well, it is true unless you ignore the facts. Let us introduce you to three basketball players from UCLA. Jalen Hill, LiAngelo Ball and Cody Riley were with their team in China for a game against Georgia Tech. Instead of representing their school and the United States in an honorable way, the three freshman thought it would be a great idea to shoplift from a store next to the hotel in which they were staying. How much of an idiot do you have to be to shoplift in China, a country that watches everything with cameras and has what we would consider draconian laws on theft? How stupid and entitled do you have to be? The three were caught and were placed under house arrest. Depending on how the Chinese would prosecute the case, the trio was looking at somewhere between 30 days to ten years in a comfy place called a China jail. As luck would have it, there was a large planned meeting of US State Department officials and the Chinese shortly after the arrests and confinement of the three players. The Trump State Department quietly pushed to have the charges of the three reduced. Allegedly, an agreement was made where the three would be held in their hotel for three weeks. They would still be in China while their team flew back to the US, but that outcome was clearly better than being in a China prison. As more luck would have it, Trump himself was in the region as part of a scheduled tour to meet with leaders of nations in Asia. One of the scheduled meetings was with Chinese President Xi Jinping where during the meeting, the subject of the three players was raised. 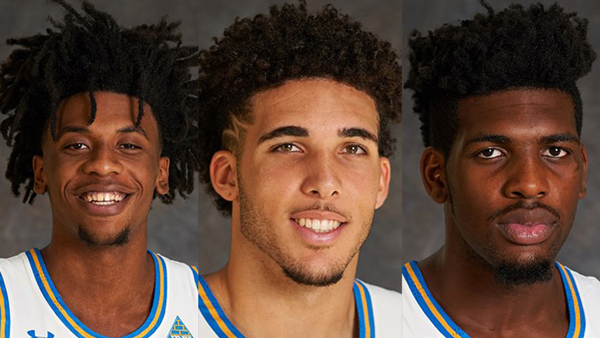 UCLA freshmen LiAngelo Ball, Cody Riley and Jalen Hill, who have been detained in China for the past week on suspicion of shoplifting, are headed back to the United States and are scheduled to arrive later Tuesday in Los Angeles, a source confirmed to ESPN. The players were seen checking into a Los Angeles-bound Delta flight at Shanghai’s Pudong International Airport, airline staff told The Wall Street Journal, who first reported that the players were heading back to the U.S. If the left’s narrative was correct, Trump could have let the three black players languish in the Chinese judicial system. He wouldn’t have cared. Instead, Trump didn’t see them as “African Americans.” He saw them as Americans. The Trump State Department laid the foundation for lowering the charges and then Trump closed the deal which has resulted in the three players coming back to their home. Are we making too much of this? Maybe. The incident is a small blip on the radar of other issues. We understand that. Yet we are always reminded that when you take care of the small things, the bigger things are easier to handle. 1) UCLA and Georgia Tech go to China to play a goodwill basketball game. 2) Three black UCLA players feel they should be able to get stuff for free. 4) After being caught, the three are facing long sentences away from the friendly sunny skies of Los Angeles and the campus of UCLA. 5) The State Department works to get the charges reduced. 6) Trump gets the three black players on their way home. So tell us again how Trump is a racist?